Rail, road network hit in Bharatpur and neighbouring areas in Rajasthan due to stir by Jat community members demanding grant of OBC reservation benefits to the community in Dholpur and Bharatpur. JAIPUR: Nine trains were cancelled and the road traffic remained affected in Bharatpur and neighbouring areas in Rajasthan due to a stir by Jats demanding OBC reservation for the community in Dholpur and Bharatpur. Rail and road network connecting Bharatpur were jammed due to the agitation. Three trains were partially cancelled and two were diverted. The agitators have disrupted the railway tracks between Alwar-Mathur and Bandikui-Agra sections, forcing the North Western Railway authorities to cancel and divert trains. Jaipur-Allahabad, Ajmer-Agra fort, Agra fort-Ajmer, Mathur-Alwar, Alwar-Mathura, Bandikui-Bareilly, EidhgarhBandikui, Bandikui-Eidhgarh and Agra fort-Jaipur trains have been cancelled. Allahabad-Jaipur, Mathura-Bhiwani, Bareilly-Bandikui trains have been partially cancelled while Ajmer-Sealdah and Jodhpur-Varanasi trains have been diverted due to the agitation, an NWR spokesperson said. Roads connecting Mahua, Agra, Bharatpur, Jaipur are blocked. State transport and private buses are being diverted to alternative routes. Market in Bharatpur is closed to avoid any untoward incident, SP Bharatpur Anil Kumar Tank said today. 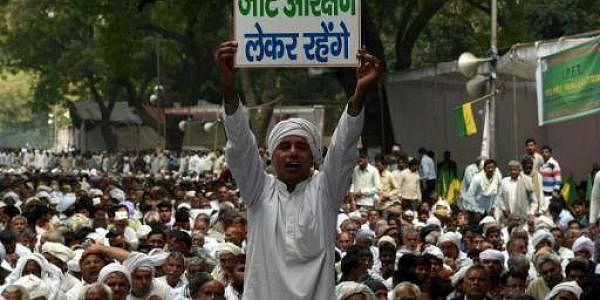 Sources said that Kaman, Bolkheda, Nadbai, Kumher, Khedli, Vehaj, Bandha, Bedham, Deeg, Garoli apart from JaipurBharatpur highway are jammed due to ongoing agitation of Jat community members who had blocked a railway track between Bedham and Vehaj railway station yesterday. The members are led by Jat leaders and Congress MLA Vishvendra Singh who are demanding reservation for the community members of Dholpur and Bharatpur districts. "People are agitated and they don't want any assurances. If government is really willing to provide reservation to Jats in OBC, they should come to Bharatpur and give people in writing when it will be implemented," Singh told PTI. He has said that Jats of Bharatpur and Dholpur have been demanding reservation since August 2015 but the demand has not been fulfilled yet. Yesterday, the OBC commission had submitted its report to Chief Minister Vasundhara Raje after which Jats members blocked a railway track following a decision taken in a mahapanchayat. State social justice and empowerment minister Arun Chaturvedi had said that the government was positive about providing reservation to Jats in Bharatpur and Dholpur and urged the community members to call off the protest. He had said that the commission has submitted its recommendations and the government would consider them with regards to the OBC quota demands.